Immunogen: Synthetic peptide corresponding to aa 9-37 of GLP-1. 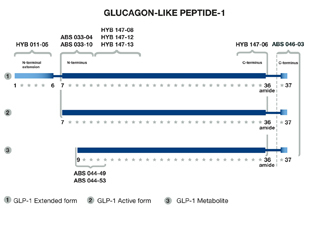 Scientific Background: Glucagon-like peptide-1 (GLP-1) is a peptide hormone of the glucagon family released in the intestine in response to eating. GLP-1 is responsible for maintaining the correct balance between blood glucose levels and levels of glucose being adsorbed in the intestine. The active forms of GLP-1 are potent stimulators of glucose-dependent insulin secretion and may be drug candidates for the treatment of obesity and type 2 diabetes.